You may have read some other review of Praecisa Acustica products here on TNT-Audio. This Italian Company from Brescia builds solid state electronics and revolutionary loudspeakers like the Nuovo, the solid-wood egg-shaped model (Uovo means Egg, in Italian, and Nuovo means New). Praecisa Acustica has become well-known in Italy for its KITs of preamps and power amps, making high-end design affordable for the average audiophile. The NSA 200 II 156 under test is the bigger power amp made by Praecisa since the top of the line is a huge 600 Watts monoblock, the PT 600. As you may easily guess, the number of each model indicates the continuos power rating per channel over 8 Ohms, so our NSA 200 under test is a 200 watts per channel dual mono solid state amplifier. So, what does the 156 number stand for? It refers to the capacitance of the power supply: 156,000 µF!!!!! Four HUGE red Italcond caps (39,000 µF each) that seem like four red Coke cans!!! This massive power supply section uses two 300 VA toroidal transformers while the output stages are equipped with high bias Hexfets (20 Watts in Class A) delivering 200 Watts @ 8 Ohms and 380 Watts @ 4 Ohms. This huge amount of power is contained into a massive cabinet (48 x 22 x 37 cm and 35 kgs of net weight) with a thick aluminium CNC machined front panel. Two feather-touch switches turn on and off the NSA 200 which, while connected to the mains, is permanently in stand-by mode. The layout of this power amp has been designed having in mind the possibility to offer it as a DIY KIT, with separated and easy to install boards and components. Hence it suffices to unscrew four Allen screws and each part of this big amplifier becomes easily accessible. The rear panel is standard: four massive speakers binding posts, two nice gold plated RCA inputs, a detachable power cord mains inlet, a ground binding post and this is all. On demand, XLR balanced inputs are available. The side panels of the amp consist of two huge heat sinks. This amp is nicely and solidly built, though the necessity to have an easy to mount/unmount design, has forced the guys at Praecisa to make use of longish cables, indeed both signal and power wires are longer than usual. Now you have this monster heavily placed on your floor and you feel it's going to be a thrilling listening experience. You won't be disappointed: the sound this powerful amp delivers is big and explosive, with plenty of energy exactly like one expects from a solid state high-power high-dynamic design. The huge amount of power becomes self-evident as soon as the musical program requires energy in the bass range: the low notes aren't powerful...they're just literally explosive and floor shaking, especially with the electric bass guitar. A full-bodied and impetuous flood of energy trasfers from the woofers to your ears and body: that's the bass range of the NSA 200. Quite surprisingly, this massive amount of energy becomes weaker the lower the bass note goes: it seems this amp isn't able to deliver the same amount of power below, say, 40 Hz. While this wasn't evident with the electric bass guitar it becomes clear with the double-bass and with the organ pedals that seem to lack some deeper note. It may sound strange but it is exactly what I've heard. Maybe it is not the first octave to be a little bit on the weak side, just the frequencies above to be a little bit *too strong*. The mid bass is simply excellent: clean, articulated and tight as it should always be. Maybe this is the portion of the audible spectrum that is better reproduced by this Italian amp. The mid range is transparent and detailed, sometimes a little bit *forward* so that less_than_good recording may sound aggressive and sometimes unbearable. It is the price to pay for a no-compromise trasparency in the mid range. In my opinion this amp does nothing to hide its solid state soul and sometimes, trying to show off its muscles (and watts) it fails to add that touch of inner grace some Music deserves. For this reason I strongly recommend the partnership with a sweet and smooth tube preamp that can counterbalance the NSA 200 aggressive attitude. Does your HiFi system need a power-kick? No fear, the NSA 200 can make sound explosive the laziest of the set-ups. Never impressed by the musical program, this amp can sound louder than you can imagine. Turn the volume up carefully and pay attention to your woofers...you've been warned: it can virtually DRIVE anything. 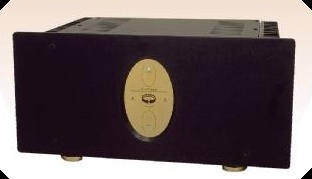 The microdynamics performance is less impressive, this amp prefers a powerful punch to a delicate caress. Fast and lively it can easily and effortlessly follow the pace and the rhythm of the Music, it doesn't matter if rock or classical. The soundstage is rather large but not very deep: the *forward* attitude of the mid range plays a key role here, so that the singers and the players appear nearer than usual. The focus is good and so is the precision of the relative positions of the players. The air between one instrument and the other is just average. This is a high-power solid state amp so please let it on for an hour (at least) before listening to it. Considering the heavy weight of the unit I'd suggest to place it directly on the floor, its nicely shaped feet will isolate it from the vibrations coming out from the loudspeakers. Power and mains cable should be dynamic, so not to destroy the impressive dynamic performance of the NSA 200. If possible, choose cables with a smooth mid-high range. Not exactly an universal power amp: its attitude needs a sweet and smooth preamp, unless you're that kind of audiophile who listens just for 1 hour a day at extremely loud levels. I would have preferred less dynamics in favour of a smoother mid-high range and a less powerful bass range in favour of a well extended bass frequency response. One can't have it all, uh? Maybe, and I say MAYBE, a better layout with shorter signal paths could contribute to a more refined performance: long cables inside power amps are a no-no, in my opinion, especially when signal and power wires run close (very close) to huge transformers and caps. Looking for floor shaking bass and dynamics? Looking for an amp that can virtually drive anything? Test listen to this NSA 200, clearly a strong arm of the...low :-), as stated on top of this review. When matched to a smooth and sweet tube preamp it can easily become the heart of an audio HiFi system with the grace of the tubes and the energy of the transistors. A strong (what else? :-)) thank you to the guys at Praecisa Acustica for having sent us this power amp to review.